Living in London – the world’s most diverse artistic community, I tend not to miss out any art exhibitions and events. Yet, I cannot describe the extent of my excitement, when I was invited to a guided tour of David Hockney’s exhibition at Royal Academy of Arts, London. Located within 5 minutes walk from both Piccadilly Circus and Green Park tube stations, the magnificent well lit 17th century building benefits from a ground floor entrance and easy step free access. Being one of the largest and most influential Art institutions in the UK, the Royal Academy (RA) offers a diverse range of services for those with disabilities. When inside, you will find yourself in front of the staircase, which is wide and clearly marked. Alternatively, you may wish to use the lift – support is also provided whenever needed. According to the website guide dogs are more than welcome. 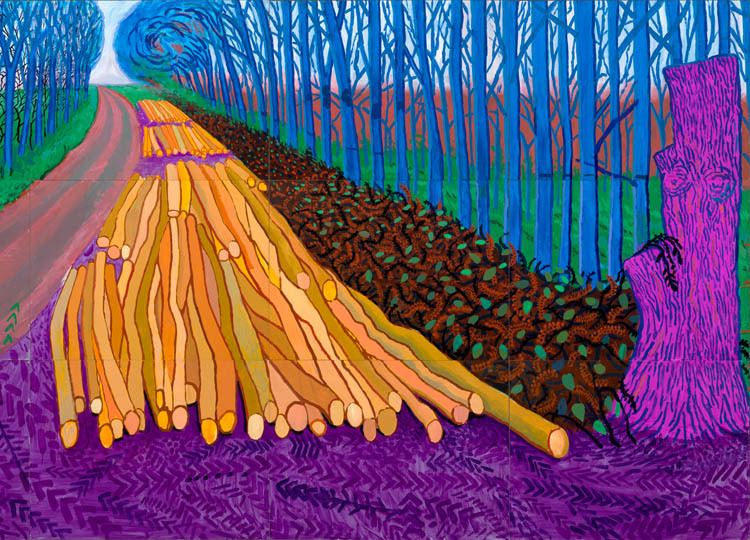 The first major display in the UK of landscape work by David Hockney consists of large scale paintings, mostly featuring the Yorkshire landscapes. Interestingly, the artist created many of these pieces in order to be showcased in the RA, along with related drawings and videos. Another part of the exhibition is dedicated to David’s use of technology, in particular his iPad drawings, which amazingly were drawn using only his finger. 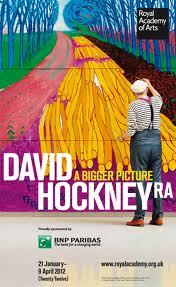 David Hockeney’s exhibition is named “A Bigger Picture” and indeed it is. When entering the first room of Hockney’s work, I was taken by the sheer size of the enormous canvases as well as his use of colour – creating realistically clear paintings. The whole exhibition is a warm colour explosion, optimism underpins his work which has the effect of creating a friendly and welcoming atmosphere in the large and imposing space. His work has a childlike quality and really does speak to his positive attitude towards life. Hockney’s iPad drawings are something worth mentioning. Printed on the highest quality paper, they are slightly less bright but still extremely engaging in terms of how much detail has been included in his landscapes. You may even enjoy the video work, which you will be able to view in the darkened cinema room located towards the back of the exhibition – the video has been created by filming the same place but using 18 different cameras (without audio). With such helpful and dedicated RA staff, not to mention our charming volunteer guide Barbara, this was a great opportunity to experience the work of a very talented artist. In fact, nothing can compare to the experience of being escorted around by a highly-skilled and knowledgeable guide who obviously has a passion for art! If you don’t have a chance to schedule a guided tour, the audio guides are available for free for blind and partially sighted people and sizeable print descriptions may be found in each room. The large scale and bright colours make this exhibition particularly accessible for a visually impaired person. However, you may want to take a break at some point during the tour, as your eyes may feel tired from the world of colour! As for myself, I found the show exceptionally inspiring, it left me feeling light and happy – an instantly positive mood. It may be helpful to book your visit at least two weeks in advance in order to allow the Academy to make any particular arrangements for you. For more accessibility info visit: http://www.royalacademy.org.uk/planyourvisit/access-guide,93,AR.html.